SAN MARCOS, Texas — Brooks County, Texas, — 70 miles north of the United States-Mexico border — has seen at least 365 migrant deaths since 2011. Specifically, Spradley collects data on the rate of decay of these cadavers. It’s part of her research in determining a migrant’s time of death. Many die in merciless heat. It is Spradley’s mission to identify them after their bodies are brought here. “Sometimes when I talk to people about what I do, they will tell me, ’Well why don’t you just send them back home?’ But we don’t know where home is. That’s what we’re trying to figure out,” she said. Spradley collaborates frequently with Hailey Duecker, the forensic investigator at the Brooks County Sheriff’s Office. Duecker added that studying the rate of human decay on donated cadavers in different environments here — shade, sun, under trees or nestled in the grass — can help answer that question. “Knowing how how fast a body can decompose in a specific environment is going to tell us a lot, like if we find a set of remains, who we can match them to based on the date of last contact,” she said. Duecker said the cadaver research is an asset in both solving cold cases or ongoing criminal investigations and in identifying migrants. “If you notice [where the cadavers are placed], the vegetation is taller than the surrounding vegetation,” she pointed out. Because Brooks County is not on the border, it gets no federal funding to identify dead migrants. The county foots the bill, amounting to hundreds of thousands of dollars per year. Among Spradley’s tools to solve the mystery of who these people were: vultures. And so some of the donated cadavers are deliberately exposed outside — unprotected — the way migrants are found. “What we’ve learned is that vultures, once they start to consume a body, it takes about four to five hours to render them to a skeleton,” she said. And Spradley said understanding how vultures devour a body has changed the way a newly discovered skeleton is analyzed. “If a family in Mexico or Honduras is missing someone that entered the United States, they can’t call law enforcement and file a Missing Persons report because they are not a U.S. citizen. So the Colibri Center for Human Rights will take the Missing Persons report,” she said. “To contrast Arizona and Texas, in Arizona, the Pima County Office of the Medical Examiner serves the entire [Arizona] border. So a body is found, it’s brought to a medical examiner’s office. And it gets a full chance at identification,” Spradley said. “In Texas, there are so many counties along the border and so few medical examiners that not everybody makes it to a medical examiner’s office. Right now we’re trying to figure out how many people die along the Texas border. We have no idea because there’s no centralized reporting system,” Spradely said. In 2012, in her lab in San Marcos, Spradley received a phone call from the Colibri Center in Arizona about a case in Brooks County. The center was calling Spradley about a 20-year-old El Salvadoran named Oscar. 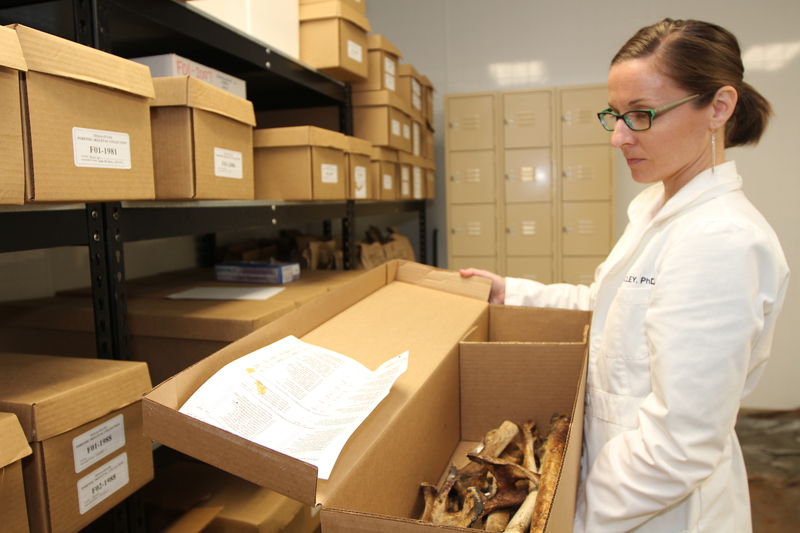 Duecker picks up the story when university anthropologists joined with forensic investigators launched a project to identify long-buried migrants. 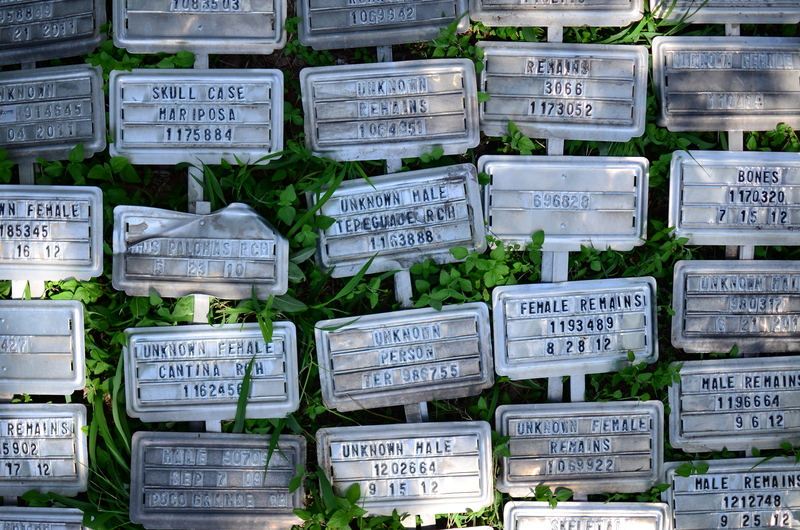 “They went into the cemetery to exhume a lot of these unidentified remains. 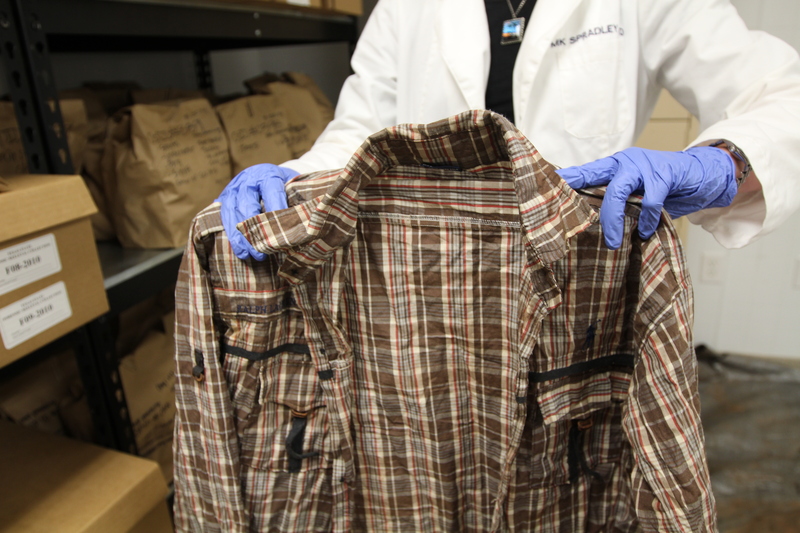 So they could have a proper attempt at identification, mainly skeletal analysis, DNA sampling, proper inventorying of photographs of their personal effects,” Duecker said. Investigators recovered the bodies of 100 migrants. They didn’t know it, but one was Oscar’s. His body was brought to Spradley’s lab. Then, Spradley said, the story turned again. “And he is now waiting to go home. His family has been notified. And he should be repatriated within the month,” she said. “We have human rights in life and in death. And everybody has the right to be identified and returned to their family. And the family has the right to know what happened to their loved ones,” she said. This entry was posted in fronteras desk, fronteras npr stations and tagged anthroplogy, border, forensics, Immigration, internal checkpoint, kate spradley, migrants, san marcos texas, texas border, texas state university, US border patrol. Bookmark the permalink.